I’m not really the Martha Stewart type. I’m not crafty, inventive or much of a farm girl. In fact, I find her very intimidating. Just this week she made rock dominos and draft dodgers. Do I need rock dominos? She also decoupaged a chest of drawers. That will never happen here. She taught her followers how to store bread, wallpaper glass coasters and decorate pencils. Uh oh! I didn’t know I was supposed to decorate my pencils? We’ve got a lot of pencils lying around here – I’m going to be busy. She made half a dozen different kinds of cookies and included how to turn cookies into an art project (really?). She’s also offering crowd-pleasing casserole recipes in the food section of her website. Aren’t you exhausted? I am, thank God I’m lying in bed writing this post. The emotions that come over me when I think of Martha are a combination of admiration (25%), disbelief (25%), and irritation (50%). Am I less of a woman because I didn’t have a Valentine’s Day Crafternoon? Yes, she called it Crafternoon. I’m always misplacing my sewing machine when it’s time to make my heart-shaped pot-holders. I’ll try harder next year. Truth be told, I don’t even know how to sew or decoupage. I don’t think my lack of craftiness is holding me back in life. At least I can cook. No more kvetching! Although the admiration I feel for Martha only makes up 25% of my total Martha emotions, let’s focus on admiration. This Martha Stewart Baking Handbook is truly my favorite. I love it, but shhhh, don’t tell Martha. I’m more of a cook than a baker, so when I have a baking question I often turn to this book. She includes lots of helpful information on baking techniques, measurements, bakeware and tools. She has included what seems to be, every basic baking recipe I’ll ever need – with photos! If you want to add one comprehensive baking book to your cookbook library, I would buy this one. When a special occasion rolls around, I can always count on my fabulous aunt to send a new cookbook my way. Until this moment, I don’t know if she knew how much I’m looking forward to receiving my next book. She gifted me this Martha Stewart book, and my whole family thanks her when I make Martha’s black and white cookies. They’re the cookies that eat like a cake. I know my New York/New Jersey followers know these cookies well. 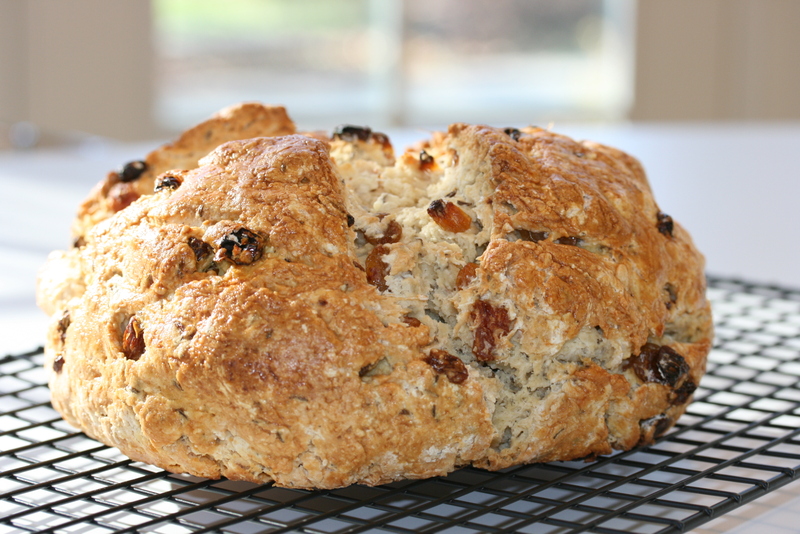 With St. Patrick’s Day around the corner, I’ve made her Irish Soda bread. I’m really the only one in the house who likes it… alas, I end up eating the whole thing. I can attest that it’s simple to make and delicious. 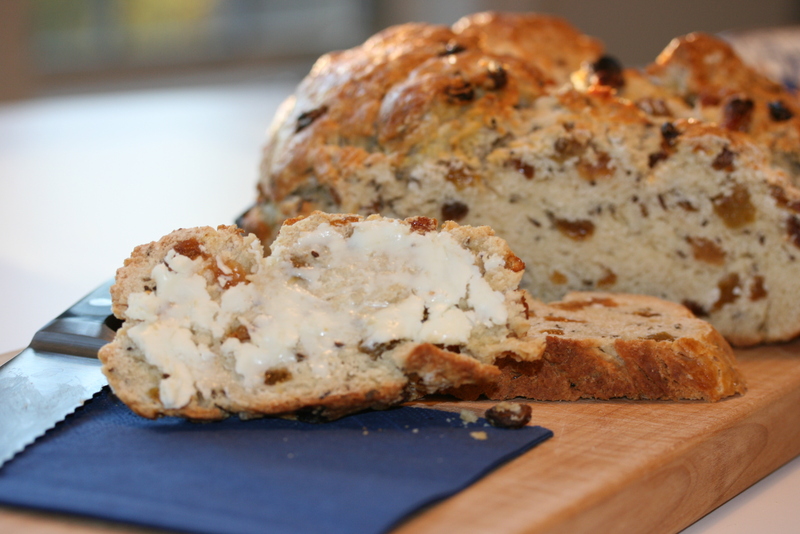 If you love Irish Soda bread and live close to me, please come over and help me eat this, I’m getting full. Happy Saint Patrick’s Day and thank you Martha! In a large bowl, combine the flour, sugar, caraway seeds, baking powder and salt. Cut the cold butter into the flour mixture using a pastry blender. You want the mixture to look like pea sized crumbs. It’s ok for there to be larger crumbs throughout the mixture as well. Toss in the raisins and combine. In a separate bowl, whisk the whole egg with the buttermilk and baking soda until properly combined. Make a well in the center of the flour mixture and pour in the egg mixture. Using a rubber spatula, begin to combine the wet and dry ingredients. Make sure you scrape from the bottom of the bowl to incorporate all the dry ingredients. Combine until the dough just comes together. Now use your hands to form the dough into a round dome shape and transfer to a parchment paper lined cookie sheet. Beat the remaining egg yolk with the heavy cream and brush the top of the dough with the mixture. Using a sharp paring knife, cut a cross on the top of the dough, in the center, about 3/4 inch deep. Bake in your preheated oven until it turns a deep golden brown and a cake tester inserted in the center of the loaf comes out clean – about 1 hour and 10 minutes. Remove the bread from the oven and allow to cool on a wire rack. Store leftovers at room temperature wrapped tightly in plastic wrap. Bread will last for up to 3 days. Enjoy slathered with lots of good butter!